Those from the Christian faith can trace it from Genesis 6:11-13 which reads “now the earth was corrupt in the God’s sight and was full of violence. God saw how people on earth had become, for all the people on earth had corrupted their ways and behold I will destroy both them and the earth”. Looking at what happened early last year, and the recent Kibaki-Ringera fiasco, there is a link between violence and corruption. The preacher in the scripture says, “Extortion turns a wise man into a fool, and a bribe corrupts the heart”. When Ringera was bestowed with the mandate to lead the anti-corruption body in Kenya, his words were “I will fight this monster with all my heart. I know I will make more foes than pals”. The metamorphosis came when the president reappointed him and it was claimed that he did not follow the due process. Some prominent law experts gave their interpretation of the law over the reappointment; extortion had turned a wise man into a fool. According to Ringera’s second definition of the term corruption, this stated “negligence of professional ethics and standards”. I tried checking the meaning of the word “ethics” and found it to be “a branch of philosophy that deals with issues of right and wrong in human affairs”. This reminded me Desmond Tutu words; “it is never the poor and oppressed who say that you can’t interfere in politics. It’s the comfortable, those on the top of the world, who say that you cant be political”. Generalization is another technique the political class have capitalised on to mislead Wanjiku. 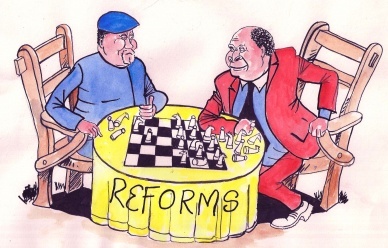 Wanjiku is shouting reforms, reforms, reforms, but the shouting seems to be landing into deaf ears. A random interview with Kenyans in the streets of Nairobi indicates the government is not doing enough to achieve the expected reforms. Perhaps they are referring to the agenda four of the peace accord. But the report from the two principals says they have scored an A in the reforms agenda. Contemporary corruption seems to be mutating day in day out. This mutation has left anti-corruption crusaders in limbo, particularly when it turns out that the civil society seem to have won the battle by portraying it as evolving around public offices and not the private sector. When one asks and another one accepts, it’s the start of corruption. The bandwagon face of corruption makes the corrupters and corrupted think it s normal. The Danish TV celebrity Mads Christensen, after a five day tour to Kenya concludes, Kenya will not develop into a well functioning democracy anytime soon. But the only route for success is formulating meaningful ethical guidelines, not inflexible rules. Remember, ethical decisions are guided by your values, your conscience, your sense of right and wrong.